Upswing needs to gather and use certain information about individuals. These can include participants, audiences, suppliers, business contacts, employees and other people the organisation has a relationship with or may need to contact. If you attend one of the above, we may ask you to fill out a feedback form in order to find out what you thought, so that we can improve what we do. We may also ask where you have come from (such as postcode or country) so we can understand how far people travel to see us, and ask for monitoring information so we can record the make-up of our audiences.We use this information to improve our understanding of our audiences and potential supporters, and to target our communications more effectively. We may share this information with our funders, to help demonstrate the impact and reach of our work. This information is always anonymised and we do not share with them anything which identifies you.We will collect data so we can build a picture of how we can improve the delivery of our projects and to engage with the widest possible group of people. If you took part in a workshop, conversation or event, we will collect data so that we can promote these events better and discover who is interested in the sort of work we are doing and how we can continue to attract a diverse group of participants. You have signed up to attend one of our masterclasses or workshops.We will retain your name and contact details, plus any additional health information you share with us that is relevant to the activity. 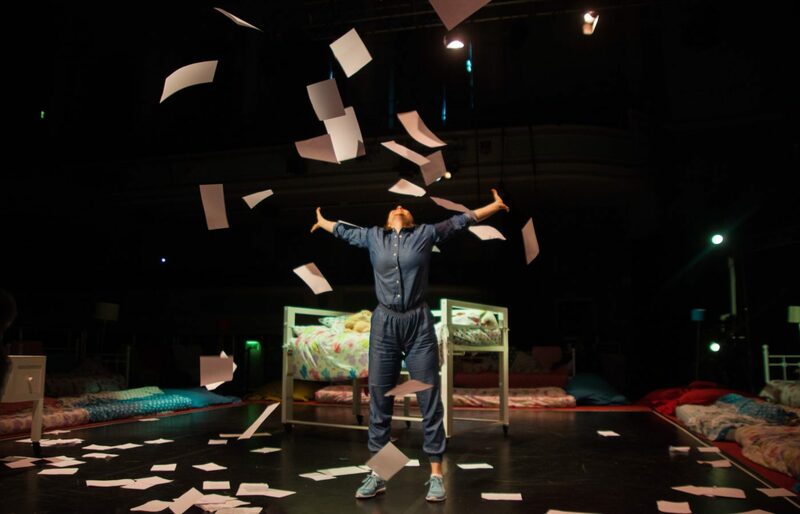 You signed up to our mailing list.We will record your name and email address when you sign up to our mailing list, and ask for your postcode or country so we can send content relevant to your area.With your consent, we will contact you to let you know about our upcoming events (including but not exclusive to performances, classes, workshops, sharings and talks), news of our plans and the progress we are making, and exclusive offers. You will also have the option to be contacted with specific masterclass updates.If you chose the option to receive information on how to support Upswing, we may contact you about donations and fundraising for Upswing only.Each time we contact you, we will offer you the opportunity to opt-out. You have contacted us via email. Your email address may be stored in our company contact lists or database. You have told a venue where we perform or partner organisation co-presenting one of our projects that you are happy for them to pass on your contact information to us. You have donated money to us either via our website (with PayPal), cheque, cash, debit/credit card, or services in kind.When you make a donation we will keep a record of your contact details, the details of the gift (amount, date, purpose) and your Gift Aid status. You have been contracted by us to provide a service, or performed in one of our productions/projects. You have contacted us regarding auditions and/or have auditioned for us, submitted a job application or sent us your CV.If you apply or audition for a job with us, we may ask for additional information about you. This is so we can improve how we target future employees, understand where individuals are finding out about opportunities with us, and who the people are that are applying.If we have requested you provide us with contact information for referees, they will only be contacted if you have been offered a job with us. They will be deleted, along with your application, 1 year after the position is filled. In our participation projects, we may collect information about the people taking part, including children and young people. This includes for example, their medical details, school / work information, details of prior artistic experience and details of any learning difficulties or special access requirements. This information will be used by our project team in order to plan and deliver the very best artistic and educational experiences, to keep participants safe throughout their experience with us, and may be passed to emergency services for use should any emergency situation arise. Cookies are very small text files stored on your computer and are used by most websites to help personalise your web experience. For further information on cookies, visit www.aboutcookies.org or www.allaboutcookies.org. We will use the information we collect as a result of you accepting a cookie from our site, to track your use of our website and to compile reports on the use of the website overall by all visitors. You can set up your browser not to accept cookies – the websites above tell you how to remove cookies from your browser. In a few cases, some features of our website may not function fully as a result. We will not retain personal data for longer than is necessary for the purpose it is required, and we’ll ensure it is securely deleted when no longer needed (see table below). We will review data to reduce the risk of it becoming inaccurate, out of date or irrelevant. Please let us know if you see any inaccuracy with the data that we are holding by emailing us at admin@upswing.org.uk. We do not sell or share personal details to third parties for the purposes of marketing. But, if we run an event in partnership with another named organisation your details may need to be shared. We will be very clear what will happen to your data if we share it and we shall not disclose your personal information unless obliged to, or allowed to do so by law. Some of our suppliers run their operations outside the European Economic Area (EEA). Specifically Dropbox, Mailchimp, Google and Paypal all have their servers in the US. Although they may not be subject to the same data protection laws as companies based in the UK, we will take steps to make sure they provide an adequate level of protection in accordance with UK data protection law. Under data protection and privacy legislation you have various rights. We want to make sure that the information we hold about you is accurate and up to date. You have the right to ask us to correct, complete or remove information you think is inaccurate or incomplete. In that case please send a copy of your ID (if we haven’t got it already) to us at admin@upswing.org.uk, with details of what amendments you propose and evidence that these are accurate – and ‘personal data rectification’ in the subject line of the email. You may have the right to request information about you in a portable format. This applies only to data that you have provided us with, which we process in automated systems either with your consent or in able to fulfil our responsibilities under a contract with you. In certain circumstances you may have the right to ask us to delete information we hold about you, or suspend or restrict its processing or object to its processing. In these cases, please contact us at admin@upswing.org.uk explaining what you want us to do – and why. We will do everything we reasonably can to ensure that you are satisfied with the way we have responded to you about your personal data and privacy. So, please do tell us if you are not so we can rectify any outstanding issues. If you are still not satisfied, you have the right to complain to the Information Commissioner’s Office (ICO) – see https://ico.org.uk/concerns/handling/.